Ufa is the capital city of the Republic of Bashkortostan. It was founded in 1574. Ufa is the industrial, economic, scientific, religious and cultural center of the republic. It was given the Order of the October Revolution. 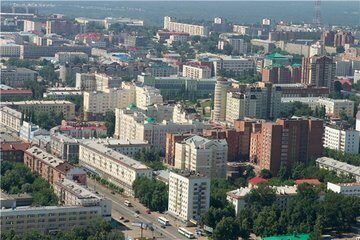 With a population of 1,064,000 Ufa is one of the largest cities in Russia. Climate is continental, rather wet, summer is warm, winter is moderately cold and long. The average temperature of Januaruy is -13,7 °C (minimum is -48,5 °C), of July - +19,3 °C (maxim is +38,6 °C). The average annual temperature is +3,4 °C. The average amount of precipitation is 577mm. The city stretches 50 kilometers from the southwest to the northeast and occupies over 710 square kilometers. The distance from Moscow by train is 1567 km. The first institute of higher education was Ufa Teachers' Training Institute, founded in 1909. Now it is known as Bashkir State University.